Price: €4,300.00 VAT included. Shipping not included. Walnut / Maple. Clareen Arch Top Tone Ring. Clareen Hand Engraved Notched Tension Band. Clareen Hand Engraved Full Flange. Clareen Hand Engraved Armrest. Decorative Binding. Choice of Tailpiece. Standard Scale 19 fret. 23 inches/585mm. Short Scale 17 fret. 21 inches/525mm. Standard Neck Width at Nut - 30mm . Clareen Banjos manufactures it's own Tone Rings and Tension Bands. All other Metalware is manufactured in Ireland where possible. The neck is fitted with two non adjustable Carbon Fibre Truss Rods for added strength. 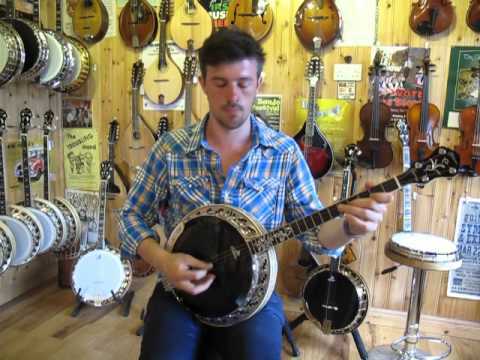 The Setanta is available in Tenor and 5-String. Open-Back option also available. All metal parts are of brass which have been nickel plated. The hooks are of mild steel which is also nickel plated. Suitable for all tuning styles. This instrument is also available gold-plated at an additional cost.